Microsoft Excel is the world's most popular spreadsheet software for desktop PCs. Excel 2010 is a core component of the equally popular Microsoft Office 2010 suite of productivity applications. on a 64-bit version of Windows and with the 32-bit version of Office/Excel installed. the full path to the workbook file containing the macros we wish to run (C:\MyMacros.xlsx). Be sure to use your own path, enclosing it in double quotes (") if it contains a space. In the Name field, enter the name that you will call the application in AlwaysUp. We have specified Excel 2010 but please feel free to enter something more descriptive of your situation. Click over to the Logon tab and enter the user name and password of the account in which you installed and configured Excel (or Office) 2010. Excel must run in this account so that it can find its configuration & settings. Excel will not work properly if you don't do this! We are now done configuring your Excel 2010 application so click the Save >> button to record the settings. 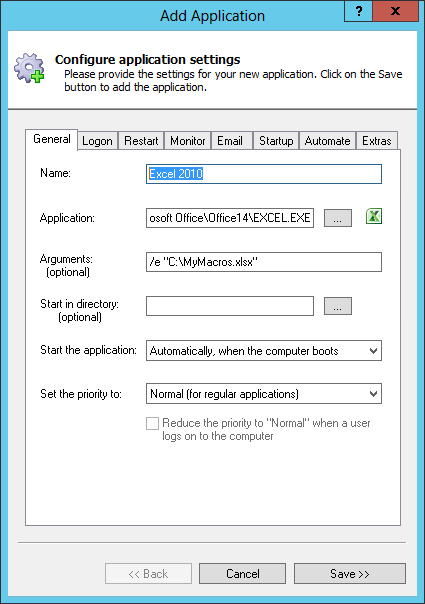 In a couple of seconds, an application called Excel 2010 will show up in the AlwaysUp window. It is not yet running though. Note that on Windows 8.1/8/7/Vista and Server 2012/2008, Excel will be running in the Isolated Session 0. Choose Tools > Switch to Session 0 to temporarily switch to the strange looking Session 0 desktop where Excel will be visible. 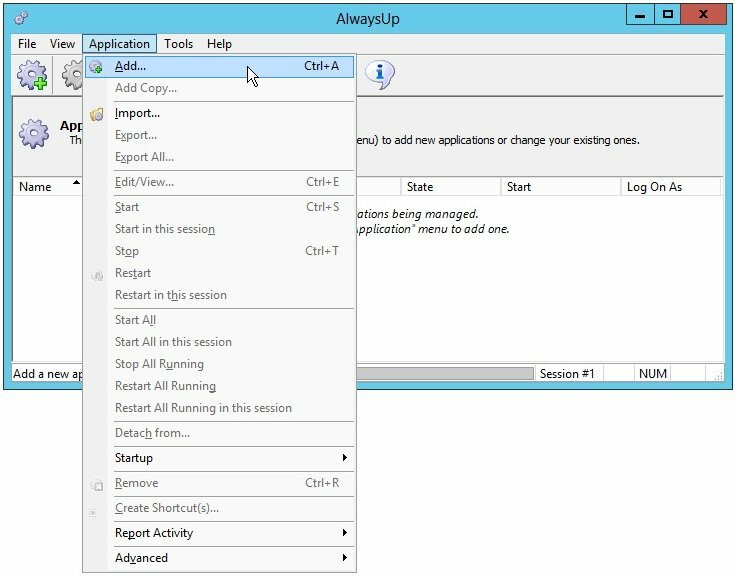 You can also choose Application > Start "Excel 2010" in this Session if you wish to start Excel visible on your desktop - which may be useful when debugging startup problems. That's it! Next time your computer boots, Excel 2010 will start up immediately, before anyone logs on. We encourage you to edit Excel in AlwaysUp and check out the many other settings. For example, run your workbook periodically instead of 24/7, use automation to dismiss alert dialogs, and much more. Excel 2010 not working properly as a Windows Service?